I’ve always had a soft-spot for physics-based games that have you navigate labyrinthine environs with weird rope and grapple mechanics that work against you as much as for you. Hang Line, from the same team behind games like Crossy Road, is just that. Newly released from Yodo1 Games, this mobile game has players clamber up the side of a mountain with a grappling hook, rescuing people and collecting gear along the way. The controls are quite simple: tap where you want the grapple hook to go. Your grapple hook can dig into snow patches, but not stone. However, out of simplicity comes challenger, as proper hook placement can have a drastic effect on your swing. On top of that, the mountain is a treacherous beast, with falling boulders and crumbling snow that can’t support your hook. A poorly placed grapple could send you plummeting to your death. 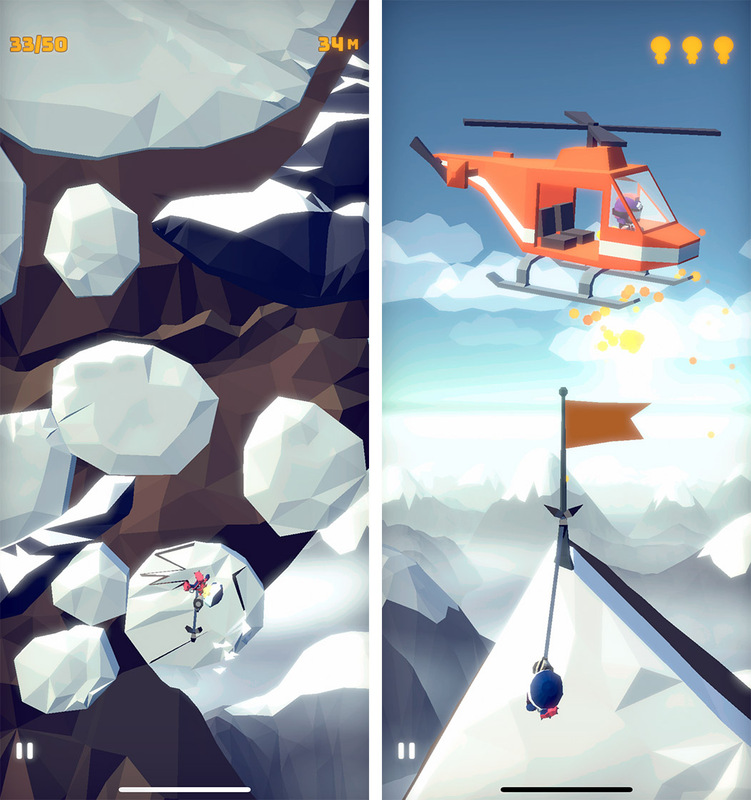 Hang Line is comprised of two main game modes. 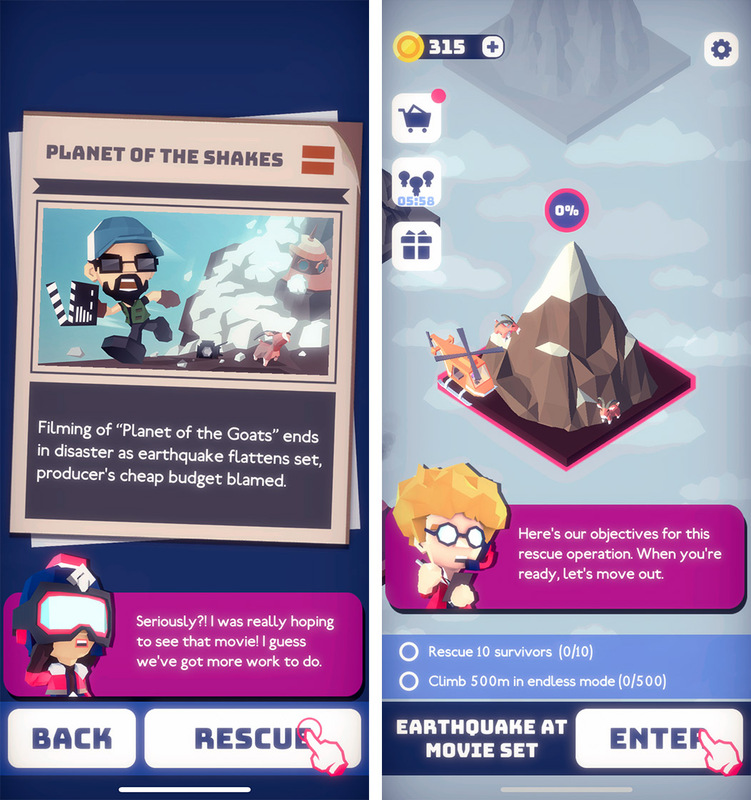 You have your standard levels, where you’re challenged to get to the summit of the mountain and either rescue stranded climbers or collect lost gear along the way. The other mode is an endless climbing mode, which challenges you to climb as high as you can. In this mode, there is no safe place to grapple, making quick movements imperative. Additionally, the game has gadgets you can use to help your ascents, such as a radar that helps find stranded climbers or a shield that prevents you from getting stunned if you collide with a wall. Collecting gear and rescuing stranded climbers will earn you coins, which you use to scan new levels for stranded climbers, making them essential to the progress of the game. Players can also collect coin donations from those they rescue. Hang Line does feature in-app purchases, but in my brief time with the game, I found they weren’t necessary to enjoy the game. Users can purchase coins or gadgets to help them in levels. Further, if you make a purchase, the game will stop serving unrequested ads. Granted, in my time testing Hang Line, I was only served two ads, so they hardly interrupted my experience. Overall, Hang Line is a fun physics game that’s equal parts challenging and silly. It’s definitely worth a try, and since its free there’s no reason not to. That said, it did just release this week, so there a few early kinks. I noted the odd stutter where the game seemed to miss a few frames. It didn’t happen often, but it was noticeable. Likely, it’s just due to some early performance issues that will be worked out as the game ages. You can get Hang Line for free on iOS and Android.